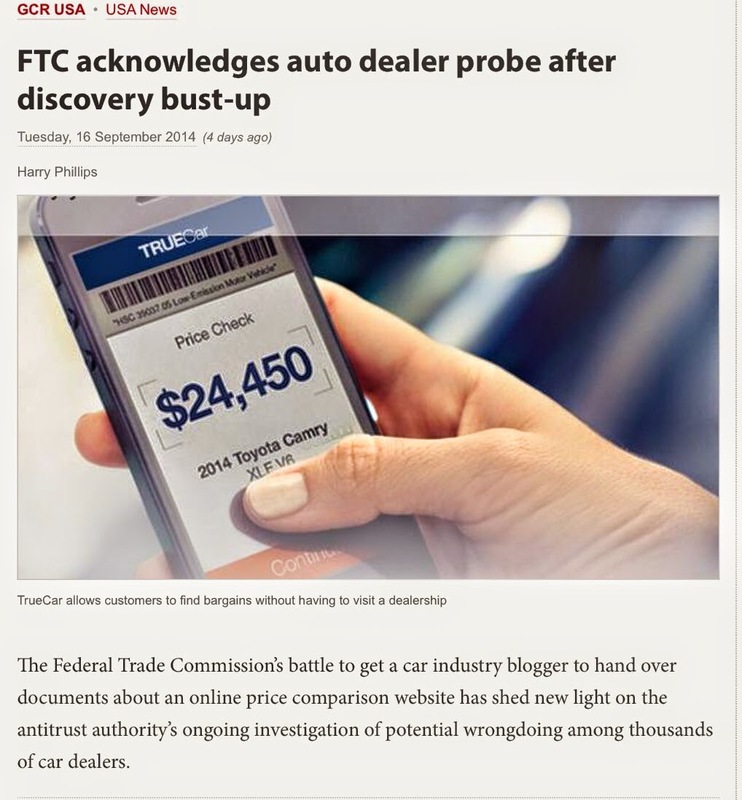 The Federal Trade Commission's battle to get Ralph Paglia, a car industry blogger to hand over confidential communications, private email, subscriber lists and documents about Truecar, an online price comparison website has shed new light on the antitrust authority's ongoing and ill-advised investigation of what they claim to be potential wrongdoing among thousands of car dealers. Mr. Phillips wrote a story last week on news that the FTC has filed a petition in Nevada Federal Court asking it to compel Ralph Paglia to provide documents and give testimony in connection with its ongoing investigation of the auto dealership industry and an alleged refusal by many car dealers to do business with TrueCar.com in late 2011 and early 2012. The FTC alleges that Ralph Paglia failed to provide various records and documents requested by the FTC within each of several civil investigative demands (CID subpoena). FTC states that the first CID was sent to Paglia in May 2014, and is now seeking an injunction in a Nevada Federal Court compelling Paglia to cooperate. The big question that Harry asked Ralph was whether or not Ralph would comply, and if so, he sought Ralph's confirmation that he now planned to comply with the FTC's demand... Or alternately, would Ralph oppose the commission's demand for an injunction? He sought Paglia's comments on the petition and the FTC's investigation of Car Dealers who either cancelled participation in the TrueCar Auto Buying referral system, or never signed up in the first place. Thank you for reaching out, and I would like to speak with you about the matter via phone. Since the NSA and presumably the FTC is studying all emails I send despite the illegal nature of such surveillance, I would feel more comfortable speaking with you by phone. I can tell you that I have never refused access to any information or records by the FTC, but I am not going to do their jobs for them. I believe slave labor was outlawed quite a few years ago and I am mystified about why the FTC seems to believe they can compel me into forced labor when their staff gets paid plenty to do the work themselves. Beyond the Nazi-like zeal the FTC seems to have for compelling Americans to do work without compensation, I simply do not understand where the Federal government gets the authority to try and squash freedom of speech, freedom of the press and determine whether an individual should to do business with a particular company. Harry Phillips, Senior Reporter for "Global Competition Review"
The FTC is investigating whether certain participants in the retail auto industry, including auto dealers and industry consultants, have engaged in an unlawful group boycott of TrueCar, Inc., a firm that helps auto dealers market their cars. TrueCar operates websites that provide detailed information about specific vehicles to potential automobile buyers, and attempts to match potential buyers with sellers. In late 2011 and early 2012, numerous comments about TrueCar appeared on various websites, online blogs, and online social networks that are frequented by auto dealers. These comments criticized TrueCar’s program of online reverse auctions, and other features of TrueCar’s websites, as unfavorable to dealers, and asserted that TrueCar was inducing dealers to sell cars at prices that were too low. Many of the comments urged dealers to discontinue their participation in TrueCar’s reverse auctions, and to terminate their dealings with TrueCar. During this period of time, the number of dealers participating in the TrueCar program and the number of auto sales consummated using TrueCar’s websites declined. See Pet. Exh. 1 (Westman-Cherry Decl.) ¶2. In February 2012, TrueCar announced that it was eliminating the reverse auction feature on its websites and narrowing the set of pricing and cost information that its sites would reveal to consumers. After TrueCar made these changes, numerous auto dealers resumed doing business with TrueCar. These changes may have made it more difficult for consumers to comparison-shop using TrueCar’s websites, thus relieving pressure on dealers to offer aggressive bids to consumers, and possibly leading to retail price increases. See Pet. Exh. 1 (Westman-Cherry Decl.) ¶3. On January 17, 2014, the Commission issued a Resolution Authorizing Use of Compulsory Process in Non-Public Investigation, File No. 131-0206 (Pet. Exh. 2). As part of the investigation, the FTC staff is inquiring whether certain consultants, dealers, or other persons or firms involved in the retail automobile industry may have organized, facilitated, or participated in a group boycott of TrueCar. Such actions can constitute “unfair methods of competition,” which are prohibited by Section 5 of the FTC Act, 15 U.S.C. § 45. See Pet. Exh. 1 (Westman-Cherry Decl.) ¶¶2-4. Respondent, Ralph Paglia, provides auto dealers with consulting services, information, and training relating to online marketing. Mr. Paglia writes frequently about online marketing and other topics of interest to auto dealers, and disseminates his writing through blog postings, comments on online social media networks, and publications on other online forums and websites. He also operates, manages, or moderates several such blogs, websites, and online social networks. See Pet. Exh. 1 (Westman-Cherry Decl.) ¶¶5-6. Many of the communications criticizing TrueCar’s business model and urging auto dealers not to participate in TrueCar’s reverse auction program appeared on websites and blogs that Mr. Paglia operates or administers. Moreover, materials on Mr. Paglia’s websites and blogs indicate that some industry consultants, dealer groups, and other businesses may have communicated with one another outside of the websites about matters relevant to this investigation. Id. ¶6. FTC staff asked Mr. Paglia to provide such information on a voluntary basis, but those efforts were unsuccessful. Id. ¶7. On May 2, 2014, the Commission issued a CID (Pet. Exh. 3) requiring Mr. Paglia to produce specified documents and to respond to written questions. On June 18, 2014, the Commission issued another CID (Pet. Exh. 4), requiring Mr. Paglia to appear and give oral testimony under oath at an investigational hearing to be conducted by FTC staff at the Office of the United States Attorney in Las Vegas, Nevada. Pet. Exh. 4, at 1. See Pet. Exh. 1 (Westman-Cherry Decl.) ¶¶8, 11. The Commission served both CIDs via Federal Express, with receipt-signature requested (and secured). Id. ¶¶9, 12; see Pet.Exhs. 5, 6. Mr. Paglia failed to comply with either the May 2 CID or the June 18 CID. He has not produced the documents or other information specified in the May 2 CID, and did not appear at the investigational hearing, as required by the June 18 CID. See Pet. Exh. 1 (Westman-Cherry Decl.) ¶¶10, 13. Mr. Paglia neither petitioned the Commission to quash or modify the CIDs pursuant to the applicable statute and Commission rules, see 15 U.S.C. § 57b-1(f); 16 C.F.R. § 2.10, nor did he submit any objections to any of the particular specifications or terms in the CIDs. See Pet. Exh. 1 (Westman-Cherry Decl.) ¶¶10, 12. To date, Mr. Paglia has not communicated with FTC staff concerning either of the CIDs, nor responded to their other attempts to reach him. Id. ¶14. with certain exceptions not applicable here. Id.§ 46(a). And, as noted above, Section 20(c) of the FTC Act authorizes the Commission to issue a CID to any person who may be in possession of documents or other information relevant to an FTC investigation. Id. § 57b-1(c)(1). 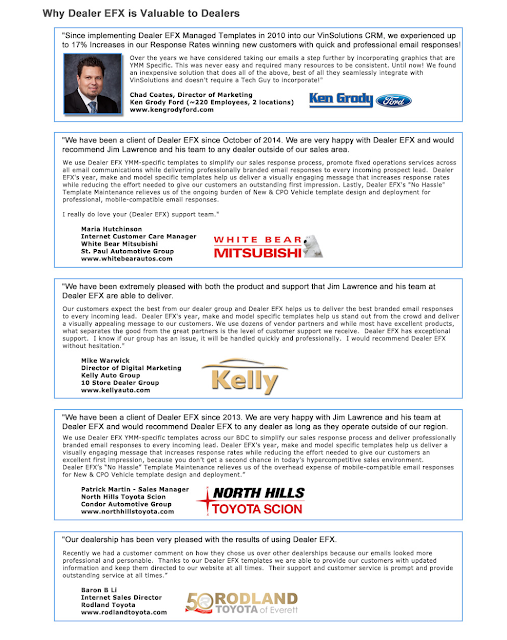 The two CIDs at issue here concern an investigation into whether certain automobile dealers, consultants, or other businesses engaged in “unfair methods of competition,” in violation of Section 5 of the FTC Act, by “agreeing to restrain competition” or “agreeing to refuse to deal with TrueCar, Inc.” Pet. Exh. 2 (Compulsory Process Resolution), at 1. Accordingly, the investigation to which the CIDs pertain is well within the scope of the FTC Act’s Section 5 prohibition. See 15 U.S.C. § 45(a) (“Unfair methods of competition in or affecting commerce, * * * are hereby declared unlawful.”). Thus, the Commission indisputably is authorized to conduct its investigation and to issue the CIDs to Mr. Paglia. Both CIDs are designed to elicit material information that is relevant to the Commission’s investigation. The specific document requests and interrogatories set forth in the May 2 CID required Mr. Paglia to produce documents containing or relating to Mr. Paglia’s communications, correspondence, or meetings with TrueCar and other auto dealers, as well as documents, including blog posts, pertaining to the effect of TrueCar’s services on retail auto prices, auto dealers’ decisions on whether to stop participating in the TrueCar reverse auction program, and Mr. Paglia’s role in operating and controlling the content of the relevant websites and blogs. See Pet. Exh. 3, Schedule, Specs. 1-6. The June 18 CID sought Mr. Paglia’s oral testimony on the same topics. See Pet. Exh. 4, at 1, 3. Pet. Exh. 1 (Westman-Cherry Decl.) ¶7; see id. ¶¶5-6, 14. See Dynavac, 6 F.3d at 1414 (in seeking judicial enforcement of its compulsory process, the government’s “slight” burden “may be satisfied by a declaration from an investigating agent.”). The CIDs seek information that is demonstrably neither “incompetent [n]or irrelevant,” to the Commission’s lawful investigation. Golden Valley, 689 F.3d at 1113-14; see also Karuk Tribe Hous. Auth., 260 F.3d at 1076 (same); Children’s Hosp. Med. Ctr., 719 F.2d at 1428 (same). They should, therefore, be promptly enforced by this Court. read the Petition and have reviewed the exhibits thereto (referred to hereinafter as “Pet. Exh.”), and verify that Pet. Exh. 2 through Pet. Exh. 6 are true and correct copies of the original documents. (This declaration is Pet. Exh. 1). The facts set forth herein are based on my personal knowledge or information made known to me in the course of my official duties. 2. I have been assigned to work on an investigation into conduct relating to TrueCar, Inc. TrueCar is a California-based company in the business of operating websites that match potential automobile purchasers with sellers and provide detailed information to consumers about the pricing of specific vehicles. In late 2011 and early 2012, numerous comments about TrueCar appeared on various websites, web logs (blogs), and online social networks targeted to auto dealers. These comments criticized TrueCar’s unique program of online “reverse auctions” and other features of TrueCar’s websites as unfavorable to dealers, and asserted that TrueCar was inducing dealers to sell cars at prices that were too low. Many of the comments urged dealers to discontinue their participation in TrueCar’s reverse auctions, and to terminate their dealings with TrueCar. During this period of time, the number of dealers participating in the TrueCar program, and the number of auto sales consummated using TrueCar’s websites, declined. 3. In February 2012, TrueCar announced that it was eliminating the reverse auction feature on its websites and narrowing the set of pricing and cost information that its sites would reveal to consumers. After TrueCar made these changes, numerous auto dealers resumed doing business with TrueCar. These changes may have made it more difficult for consumers to comparison-shop using TrueCar’s websites, thus relieving pressure on dealers to offer aggressive bids to consumers and possibly leading to retail price increases. 4. In connection with this investigation, on January 17, 2014, the Commission issued a Resolution Authorizing Use of Compulsory Process in Non-Public Investigation, File No. 131-0206. This Resolution authorized the issuance of Civil Investigative Demands (CIDs) to gather information about “whether firms in the retail automobile industry, including automobile dealers and industry consultants, may be engaging in, or may have engaged in, conduct violating Section 5 of the Federal Trade Commission Act, 15 U.S.C. §45, as amended, by agreeing to restrain competition, including by agreeing to refuse to deal with TrueCar, Inc.” Pet. Exh. 2 (Compulsory Process Resolution), at 1. 6. Mr. Paglia writes frequently about online marketing and other topics of interest to auto dealers, and disseminates his writing through blog postings, comments on online social media networks, and publications on other online forums and websites. He also operates, manages, or moderates several such blogs, websites, and online social networks , including www.dealerelite.net, ralphpaglia.blogspot.com, www.automotivedigitalmarketing.com, www.automotivedigitaltraining.com, and automotivesocial.com. Many of the comments criticizing TrueCar’s business model and urging auto dealers not to participate in the TrueCar reverse-auction program appeared on websites and blogs that Mr. Paglia operates or administers. Moreover, materials on Mr. Paglia’s websites and blogs indicate that some industry consultants, dealer groups, and other businesses may have communicated with one another outside of the websites about matters relevant to this investigation. 7. Accordingly, the FTC staff believes that the investigation would be furthered by obtaining information that Mr. Paglia may have in his possession relating to the online communications, direct communications, and other activities at issue in the investigation. The FTC staff made a number of attempts to secure such information from Mr. Paglia on a voluntary basis, but Mr. Paglia declined to provide any information in response to the FTC staff’s inquiries. 8. On May 2, 2014, the Commission issued a CID (Pet. Exh. 3) requiring Mr. Paglia to produce specified documents and to respond to certain written questions. Specifically, the May 2 CID required Mr. Paglia to produce documents containing or relating to communications, correspondence, or meetings with TrueCar and auto dealers. The CID also sought documents, including blog posts, pertaining to the effect of TrueCar’s services on retail auto prices, auto dealers’ decisions on whether to stop participating in the TrueCar program, and Mr. Paglia’s role in operating and controlling the content of the relevant websites and blogs. Pet. Exh. 3, Schedule, Specs. 1-6. 9. The Commission sent the May 2 CID to Mr. Paglia via Federal Express on May 5, 2014, with a requirement that the package be signed for upon delivery. The Federal Express tracking receipt (attached hereto as Pet. Exh. 5) shows that the May 2 CID was delivered to Mr. Paglia’s address and signed for on May 7. The May 2 CID directed Mr. Paglia to produce the requested documents and information by May 21, 2014. See Pet. Exh. 3, at 1. 10. Mr. Paglia neither petitioned the Commission to quash or modify the CID, in accordance with the relevant statute and Commission rules, see 15 U.S.C. § 57b-1(f); 16 C.F.R. § 2.10, nor did he submit any objections to any of the specifications in the CID. Nonetheless, to date, Mr. Paglia has not produced any documents or information in response to the May 2 CID. 11. On June 18, 2014, the Commission issued a second CID to Mr. Paglia (Pet. Exh. 4), requiring him to appear and give oral testimony under oath at an investigational hearing to be conducted before me. The June 18 CID specified that this hearing would be held on July 10, 2014, at the Office of the United States Attorney for the District of Nevada, at 333 Las Vegas Boulevard South, Suite 5000, Las Vegas, Nevada 89101, commencing at 10:00 a.m. Pet. Exh. 4, at 1. 12. The Commission sent the June 18 CID to Mr. Paglia via Federal Express on June 23, 2014, with a requirement that the package be signed for upon delivery. The Federal Express tracking receipt (attached hereto as Pet. Exh. 6) shows that the June 18 CID was delivered to Mr. Paglia’s address and signed for on June 26. Commission staff also made informal attempts, by letter and email, to contact Mr. Paglia to discuss the upcoming investigational hearing. Mr. Paglia neither responded to this correspondence, nor filed any objections to the terms of the CID, nor petitioned the Commission to quash or modify the CID.